Equestrian portrayal is an integral part of Wolfe Argent and with equestrian portrayals comes great responsibility. For more information, please contact the Mareschal for the Equine Guidelines. Historically, most of the lances of the Companies of Ordinance were very equestrian oriented. There were several mounted members in a lance: The Chef de Chambre was the primary mounted man-at-arms; the mounted valet acted as horse holder for the archers when they dismounted to fight, he also rode one of the Chef de Chambre's spare mounts; the coustillier (mounted swordsman), acted as a secondary cavalry man, his role was much like a modern wingman, covering the Chef de Chambre and offering his horse should the Chef de Chambre's mount fall in battle; and three mounted archers. These three archers were a form of mobile artillery, riding from place to place on the battlefield, and then dismounting to fight. The other soldiers that formed the lance — the pikeman, handgonner, and crossbowman — were all on foot. 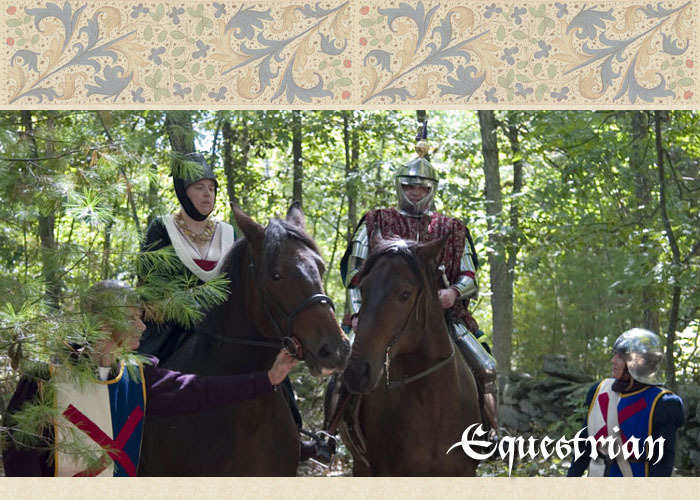 Per the Ordinances of Duke Charles, we practice drilling with ground troops, to acclimate the horses to move comfortabley amongst armoured men and a forest of hafted weapons. We also practice mounted skill-at-arms. 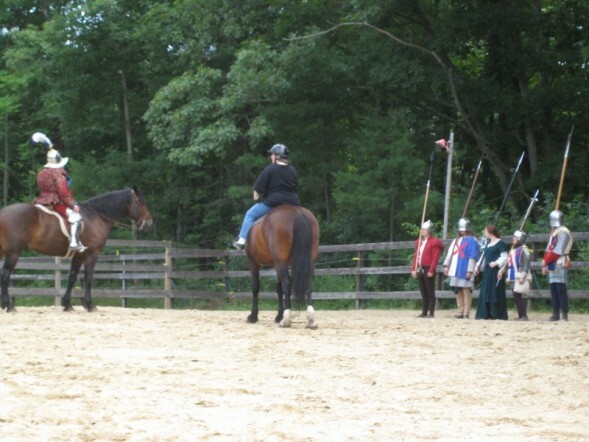 Skills at arms are weapons skills with lance, sword, mace, etc... that are used from the back of a horse. First among these skills is work with the lance as it was used for combat, not sport. The purpose of the use of a lance is as a shock weapon to be used en masse in a cavalry charge. Once the charge has been completed, the cavalry would drop the lance and draw their secondary weapons, typically a hammer or mace, and lay about them, inflicting damage to the enemy with crushing blows. 3D fallow deer target for use for displays of hunting skills and work with a spear or javalin.